Tencarva’s precision mechanical seal repair center, located in Greensboro, N.C., provides capabilities for prompt seal repair that few distributors can provide. What this means for the customer is that Tencarva offer’s expert repair for most mechanical seals in a reasonable repair period. Seals for repair can be delivered to local Branch Offices or shipped direct to our Greensboro repair center. Typical repairs take about three to five days. Tencarva’s equipment includes one course seal face grinder and two lapping tables– rough and fine for micron lapping and a Lapmaster Monochromatic Light to verify the accuracy of our work. Tencarva’s meticulous “Seal Master” is experienced with over six years of specific seal repair experience; including Burgmann and John Crane seal repair training. If Tencarva gets the damaged seal parts, our team can fix them: John Crane, Chesterton, Burgmann and others. Our preferred mechanical seal vendor is John Crane. Tencarva has a Mechanical Seal Bounty Trade-In Program that offers discounts on a new Crane seal when replacing another manufacturer’s seals that cannot be repaired. The John Crane seal will be comparable or better. Faces Lapping Procedure – Hard and soft faces ground– Lap 1: coarse, Lap 2: fine. Faces re-lapped and brought back to true smoothness (often exceeding industry standards). Repair Parts Ordered – when approved and if needed. Delivery – Shipped back to customer, or ready for customer pickup. 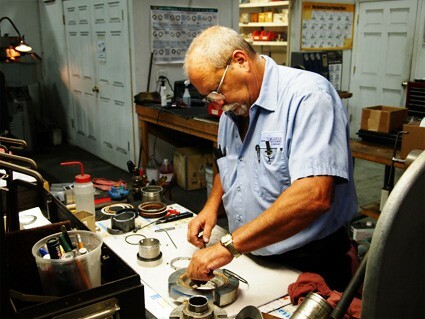 Prompt attention to proper seal repair is vital to your pump’s smooth operation. The mechanical seal is generally the weakest part of a pump, and if the mechanical seal fails, the entire pump is disabled. Having that knowledge, a better decision can be made about the repair, because many people never think about the seal as the pump’s most common “do or die” part!